George A. Romero gave us the best zombie trilogy ever in Night Of The Living Dead, Dawn Of The Dead and Day Of The Dead (see below). For decades his fans have been screaming for another and finally it has arrived. 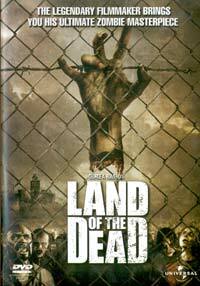 This movie was approached from Romero's zombie universe perspective, taking the logical plot of how the human race will deal with an epidemic of living dead. Survivors have organized themselves to contain the zombies by fencing off parts of the city with a defense force keeping the "stenches" (as they're called) out. It has however created another class structure where those with the means and breeding get to live it up in a luxury high rise called Fiddler's Green. The rest have to live in slums on the ground. Teams are sent out to secure supplies, at the same time thinning out the zombie population (ever so slightly). An armed panzer vehicle, Dead Reckoning (owned by the kingpin of Fiddler's Green) is instrumental in these operations. But the big man (played by Dennis Hopper) screws over Leguizamo's character (doing his dirty work), who wants in at the Green (but he's not the right "kind"). He tries to have him knocked off, but fails, resulting in the guy stealing Dead Reckoning and threatening to blow up Fiddler's Green. At the same time the zombies are becoming more conscious about their survival and led by a gas attendant mass together and head for the city, re-learning basic skills along the way (another evolutionary step further from the Bub character in Day Of The Dead). As a new species on its own, they make up the bottom of the ladder. Where Romero used a black protagonist in both Night and Dawn, here his black hero is the one leading the zombies - a nice twist. Besides Romero's consumers-run-rampant analogy of previous flicks, this script is the most social and political thus far and adds a very interesting dimension to the basic action and horror that can be delved from the subject. With the single location concentration of the early Living Dead movies, this film does lack that intense dramatic focus of the previous installments, but make a very cool addition to the series with enough gore for horror fans, action for those who like it and a bit of a message beneath it all. Tom Savini makes a cameo appearance as the leather jacket zombie from Dawn Of The Dead, and even if the movie were useless, this would be enough to get the fans cheering. NB. For a rare chance to see the original Night of The Living Dead and Dawn Of The Dead on the big screen, check out the first South African HORROR FESTACULAR of late-October / early-November. Click the link below.